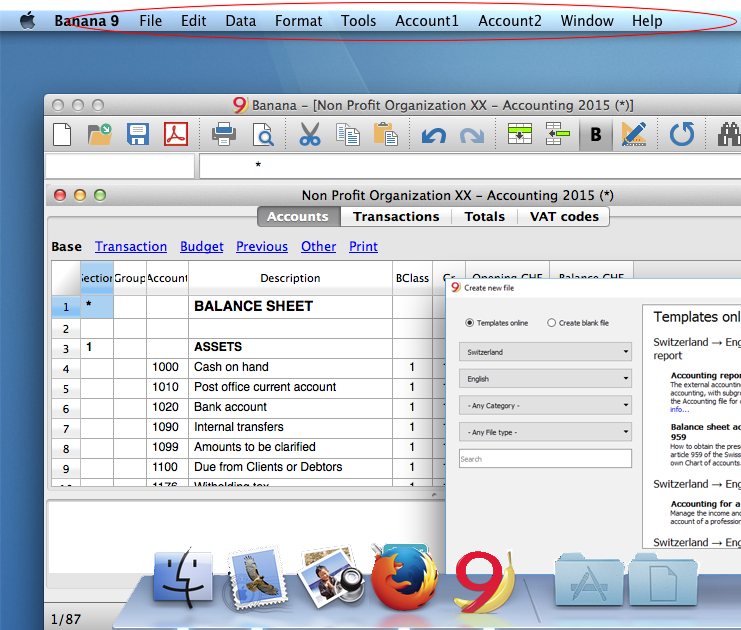 The Banana Accounting Mac version is a native application for Mac. The software is spreadsheet inspired, and perfected for a professional accounting use. Files created with Banana 9 for Mac are completely interchangable with the Banana for Windows, Linux and Android versions. For the installation, Mac OSX 10.14, 10.13, 10.12 (or more recent versions) are required (see System requirements). The installation process is thus very simple and no need of using emulator software. 100% of compatibility in exchanging files with Banana Accounting for Windows, Linux and Android with previous versions. Without entering the license key, the program works in a Free Version mode, which allows you to use all the features up to 70 transactions. Cash book and Time sheet management are already unlimited. Data entered with the Banana Accounting Free Version can be saved and retrieved. If you purchase a license key and enter it in the Free Version, all limitations will be lifted and your software becomes an unlimited Full Version.